On September 22, 2011, Volunteer Ottawa hosted a night of celebration and recognition for all Ottawa volunteers. Complete with red carpet and famous Ottawa celebreties, the VOscars was a huge success bringing together the volunteers who have put countless hours towards a good cause. The night ran very much like the event’s counter part, the Oscars, but instead of Brad Pitt we had Max Keeping (much better). The night started off with a performance by Karen Harrison, a local musician and singer. Karen has a natural-born talent to light up the room with her remarkable voice. As I chatted with some VOscar attendees I could have sworn there was a recording playing in the background, until I turned to the stage to see Karen singing, live. Her debut album is set to launch at the end of 2011. Check her out on her Facebook page. Andrian Harewood was the nights MC and presented each presenter. The nominees for each award would be read out followed by a pause with a fun or interesting fact about Ottawa volunteerism, just to keep the suspension going. Winners were announced and their stories was told. I felt proud to be part of a city with so many outstanding volunteers. Did you know Ottawa contributes over 6 million volunteer hours each year, which is equivalent 3763 full time jobs. That is work done for free, during the free time of the caring and hard working individuals of Ottawa. Megan Ellwood was awarded the Mayor’s Award for volunteer spirit. Megan has been an avid volunteer since she was 11 years old. She gives back to a variety of organizations, such as: Girl Guides of Canada, City of Ottawa, Ontario Special Olympics, Crystal Bay School and more. At 21 she continues to volunteer while juggling a full time school schedule. The Best Volunteer in a Professional Field award went to Heidi Hauver. Heidi is an innovative management professional who is passionate about the field of Human Resources. She was a board of director with Make A Wish, ADAO, Nelson House and continues to donate her time and experience to various organizations. The Best Non-Profit Volunteer Program award went to the Ottawa Folk Festival for their volunteer community of over 650 individuals. The Best Corporate Volunteer Program award went to PricewaterhouseCoopers, an organization with over 200 employees. PwC created a foundation to provide grants for employees to assist in training and support for their employees’ volunteer endeavors. The Best Volunteer in a Leading Role award went to Ann Mainville-Neeson, a strong believer in giving back to her community. From being a Big sister, to being a member of the fundraising committee to the chair of the Big Brothers Big Sisters Ottawa Board of Directors, Ann continues to give back. The Best Volunteer in a Supporting Role award went to Harold Moore, an Ottawa volunteer for over 45 years. He was the co-founder with Thomas Asslay of Aktion Club of Ottawa. The big award of the night, the Lifetime Achievement Award, went to none other than Max Keeping. While Max delivered his acceptance speech the crowd was silent and hung on every word. A truly remarkable man whose list of achievements stretch around the world… and back. You can read about his remarkable contributions on the Volunteer Ottawa website. So the next time you are in the presence of one of these outstanding volunteers thank them for their hard work and for their contribution to a better Ottawa, then ask for their autograph! For more information on the VOscars visit their website. 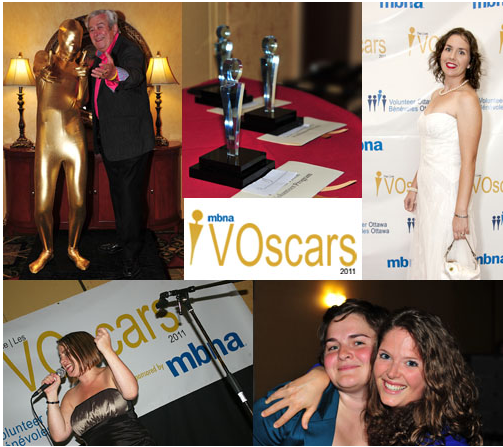 To see the celebrities on the red carpet check out the VOscars album on the Volunteer Ottawa Facebook page. Remember, volunteers are paid nothing not because they are worthless, but because they are priceless. Volunteering is important, share your volunteering stories and triumphs by leaving a comment. This entry was posted in PR Word of the Week and tagged Ottawa, volunteer ottawa, volunteering, voscars by Kristine D'Arbelles. Bookmark the permalink. Great post. Thanks for the kind words about Volunteer Ottawa and the event. So glad you enjoyed it. Next → Next post: Read the “engaging” story!